In a time when football is dominated by big corporations, player agents, Russian billionaire’s and Sheiks from the many nations of the Middle East; ticket prices soar and the cost of a pint exceeds £4, the attraction of the Non League game becomes more and more appealing. The average working class football fan is becoming priced out of attending the matches of the larger clubs in their locale, especially in the Premier League, where recently the cheapest ticket to watch Arsenal play Manchester City was a lofty £62. Despite Arsenals reputation for playing the most attractive football in the country it is no wonder many seats remain empty at the Emirates with ticket prices so high. How can anyone be expected to fork out that sort of money on a weekly basis to watch 90 minutes of what is essentially just 22 blokes running around on a field? Although, there will always be a certain attraction to English professional football that cannot be rivalled even by the top league’s abroad, there is an important place for the small clubs, semi professional and amateur, around the country. There is a certain sense of togetherness and community when attending a Non League game. Small stands, terraces and the proximity of the pitch and players all contribute to a very distinct atmosphere. This is no different at Nethermoor Park, the home of Guiseley AFC, a club from West Yorkshire currently competing in the Blue Square Bet Conference North division. The £10 entrance fee to the stadium is a far cry from the prices of the professional clubs and for the football on show; it is well worth the money. Guiseley currently occupy 2nd place in the Conference North with four games in hand over league leaders Chester FC, who were born out of the demise of former Football League side, Chester City FC in 2010. Guiseley hold a strong and deserved league position as 20 wins from 24 games see’s The Lions sit 8 points clear of 3rd placed Brackley Town, who have actually played two games more. However, their contribution is not just purely entertainment for the local people. 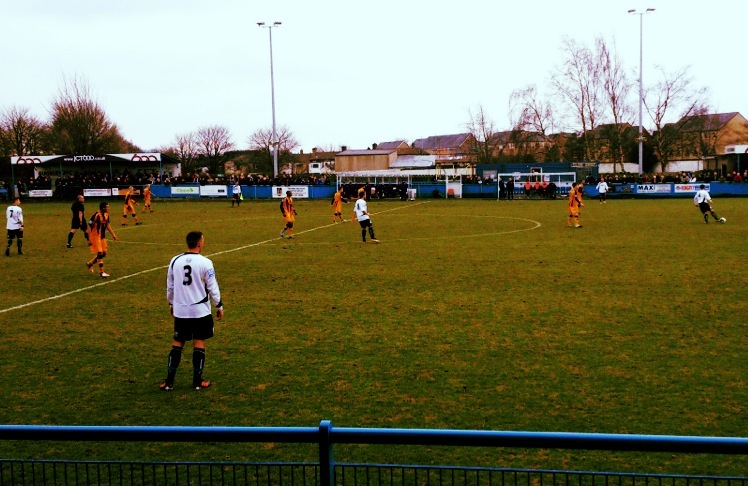 Many of the Non League football clubs provide vital community links for the local population and Guiseley are a prime example. The Lions run several affiliated junior sides providing the next generation of footballers the opportunity to enjoy and play football outside of school. Guiseley also run their own football academy which offers students a post sixteen education, where they study for a Level 3 BTEC award in Sport alongside the chance to play football for the club. These initiatives are a fantastic show of commitment to the local community from Guiseley and offer something more tangible in return for the fans support. In The Lions most recent game on Saturday 9th February the promotion chasers faced another, former Football League side in the shape of Boston United. Once the subject of the classic Soccer AM American commentary parody, Boston were relegated from Football League Two on the final day of the season in 2007. Due to major financial problems the club had encountered, Boston were actually demoted two divisions to the Conference North and have not moved out of that league since. 742 football fans, young and old came to Nethermoor Park on a mild Saturday afternoon to watch Guiseley take on Boston and despite the friendly, family atmosphere around the ground, the football on show had the same competitive edge as in any match in the professional game. It was a nightmare start for Boston as Guiseley robbed them of possession straight from the first whistle. Centre back, Andrew Pearson was well placed at the back post to score a controlled header with less than a minute played. The United keeper had rushed out in an attempt to punch clear Andy Holdsworth’s free kick from the left hand side, but found himself in no man’s land and Pearson was free to direct his header into the back of the net. The Lions played some entertaining football throughout the game as ex-Huddersfield Town and Oldham Athletic midfielder Andy Holdsworth dictated the game from the centre of the park. Holdsworth’s experience and class in midfield made a telling difference as he looked to play the simple pass and maintain possession of the ball. Both full backs were willing to get involved with the play, short, one-two passing moves provided success for Guiseley in the wide areas of the field with Kevin Holsgrove and James Walshaw threatening every time they had the ball at their feet. The Lions top scorer, Josh Wilson cut an accomplished figure up front, causing the Boston centre backs constant problems as he won almost every header, held the ball up well and brought his team mates into the game. Boston managed to hold their own but never looked particularly threatening as Guiseley goalkeeper Steven Drench had little to keep himself occupied. Spencer Weir-Daley, whose previous clubs include Nottingham Forrest and Notts County, looked the most dangerous man for United but his only effort of note was saved well by Drench. Guiseley had a couple of clear cut chances in the second half only to be denied by the United goalkeeper, but eventually The Lions doubled their lead with another header, this time from James Walshaw after 65 minutes of play. Boston looked a little more dangerous in the latter stages of the second half and did manage to grab a late consolation through a deflected free kick from Ben Milnes. 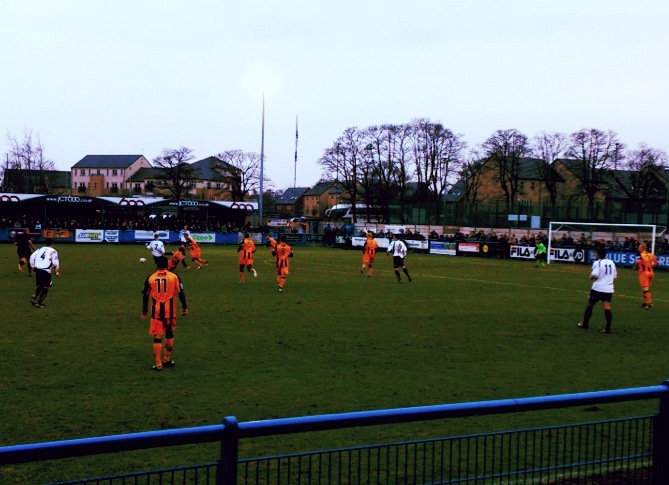 However, Guiseley were not to be denied their victory which on the balance of play was thoroughly deserved. Guiseley’s unbeaten run now extends to thirteen games and the pursuit of league leaders, Chester continues. The prize of a place in the Conference Premier awaits the winner of the Conference North and Guiseley are on track to push Chester all the way to the end of the season for this honour. While the price and rewards associated with the professional game, in particular the Premier League continue to rise, Non League football remains as entertaining as ever. The Conference Premier and the Conference North and South provide football fans with very viable alternative to the games of the professional clubs. 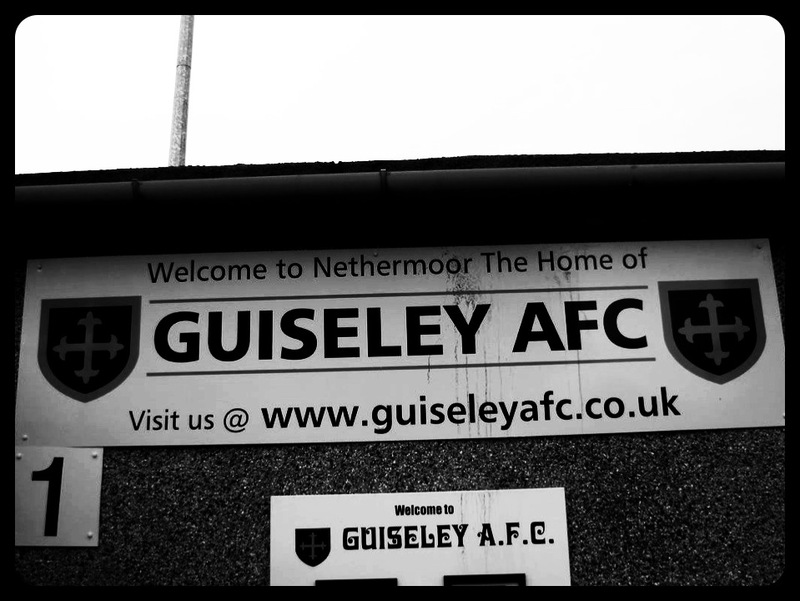 A Saturday in the life of a Non League club is well worth the time and money and I would recommend a trip to Guiseley’s Nethermoor Park to any football fan. A nice look at lower league football, totally agree that top tier football is massively over-priced. The problem is that many small clubs and conference sides now need to charge up to £20 a ticket just to survive, little wonder that there are less season ticket holders and children going to games all around the country all all levels of the game! Thanks for the comment Ben. I completely agree, it’s a shame that the smaller clubs have to charge more just to stay afloat! I will definitely visit your blog again.